Tomorrow, many of us will make one or more New Year resolutions. Let today's column become the foundation for yours. Society considers that which is white to be pure. Such a belief can be deceptive. By shining white light through a prism, one is instantly blessed with the hidden beauty and complex nature of our universe. A pure white beam of light reveals its inner essense. 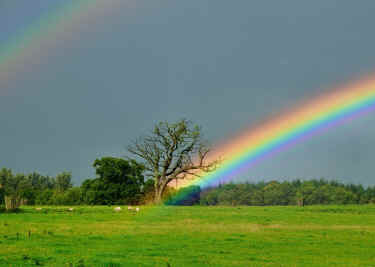 Most people can name the seven visible colors of the rainbow's spectrum. Violet, indigo, blue, green, yellow, orange, and red. Of course, there are two other colors, often forgotten, but always present, ultraviolet and infra-red. Animals and insects feel these colors. Plants sense them, too. While we lack the same receptors and are blind to their existance, our handicap cannot negate their influence. The ultras and infras of plants are magical substances! They include plant chemicals, or phyto chemicals such as isoflavones and bioflavinoids. Science teaches us that plants protect themselves from attack with their own secretions and chemical messengers. Vegetables repel insects who would eat them, and blossoms attract other insects with a perfume, so that their pollens can be spread and their species self-propagate. Plants protect themselves from too much heat, or cold, or wind, or too much moisture, maintaining their own good health with their specialized hormones. Plants can cure their own sicknesses and cancers by secreting and bathing themselves with these enchanted essences. When we eat the plants, we are similarly protected. Modern science has confirmed the centuries-old traditions and lore from cultures that refined the sacred techniques of using foods as medicine. Eat foods of color. The perfect color can be found right in the middle of our rainbow, the color green. There is a pot of gold and jewels within that rainbow, and these treasures so contained can be cashed in to purchase good health. The violet, indigo and blues of the plant kingdom includephenols and dithiolthiolnines contained in eggplant, cruciferous vegetables, grapes, plums, and grains. Remarkably, the one plant containing the greatest amount of these wonderful phytochemicals is the soybean. Soybeans contain coumarins, flavonoids, inositol, isoflavones, lignans, phenols, plant sterols, protease inhibitors, saponins, and Omega 3 and Omega 6 oils. For many years, it has been said that "an apple a day keeps the doctor away." Such wisdom! 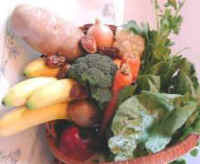 Each day of one's life should reflect a lifestyle that includes this maxim: For the best of health eat a rainbow today!